The set for Absurd Person Singular required three kitchens. 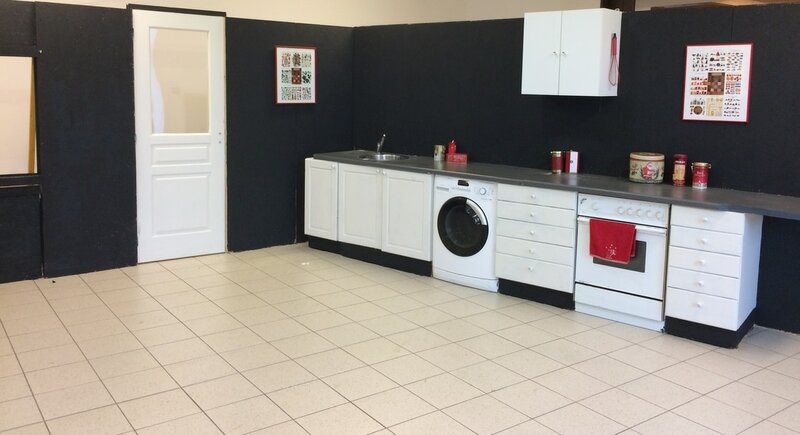 Without a revolving stage we had to 'cheat' by making the kitchens look different. This was achieved by having all the flats painted black then dressed in themes. Two kitchens had glazed exterior doors, one had opening windows and all had running water and drainage. We built the set at our rehearsal facility in Caillavet and flat-packed it to Lectoure. The same set was used on the slightly smaller stage at Maubourguet.The really observant may have noticed the red whisk on each of the three sets — it was the main design icon on the posters and flyers. 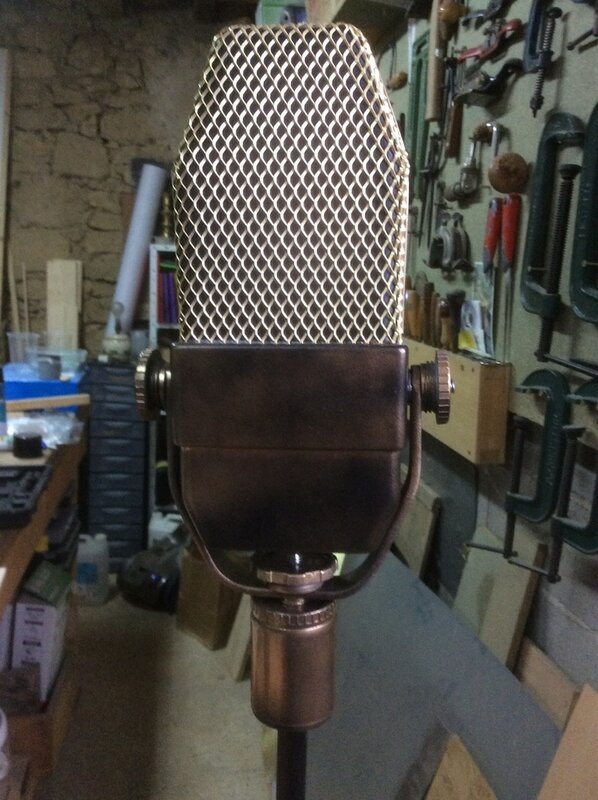 Our first bespoke props — authentic BBC microphones. 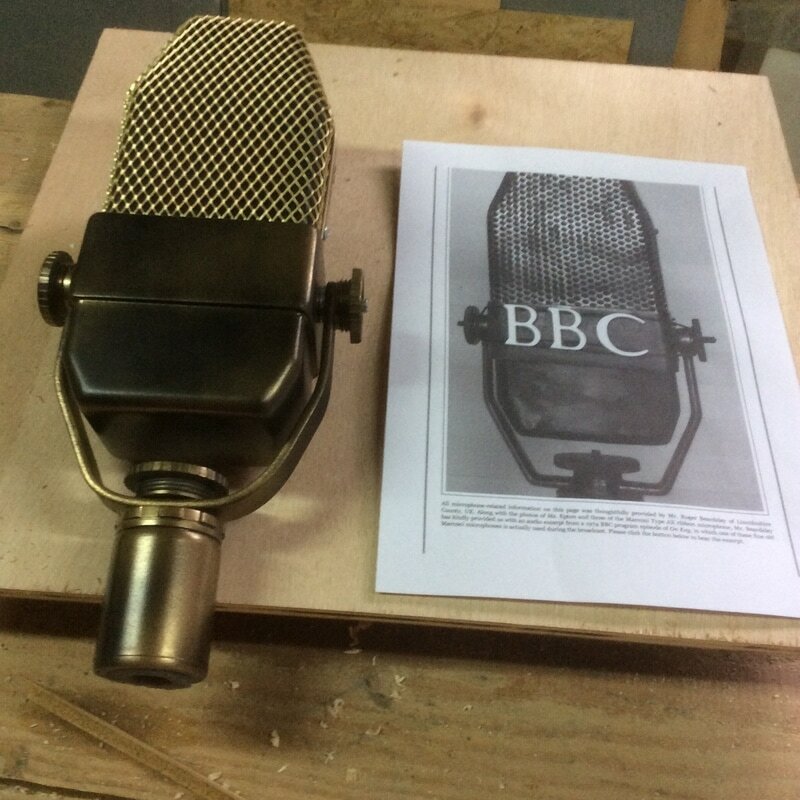 A few weeks ago I asked Brian Edward, the English Theatre Company lighting engineer and prop maker, if he'd make two period BBC microphones from the 1940s that we could use for the radio theatre. He immediately drew one on a piece of paper and said, "What, like this?" I showed him a photo of one I'd found and he'd drawn it exactly - a BBC type A microphone in use from 1934 to well into the 50s. I knew that Brian would produce something that looked really good but I had no idea to what lengths he'd go to reproduce the original. Brian set about building a life-size of the original BBC model. 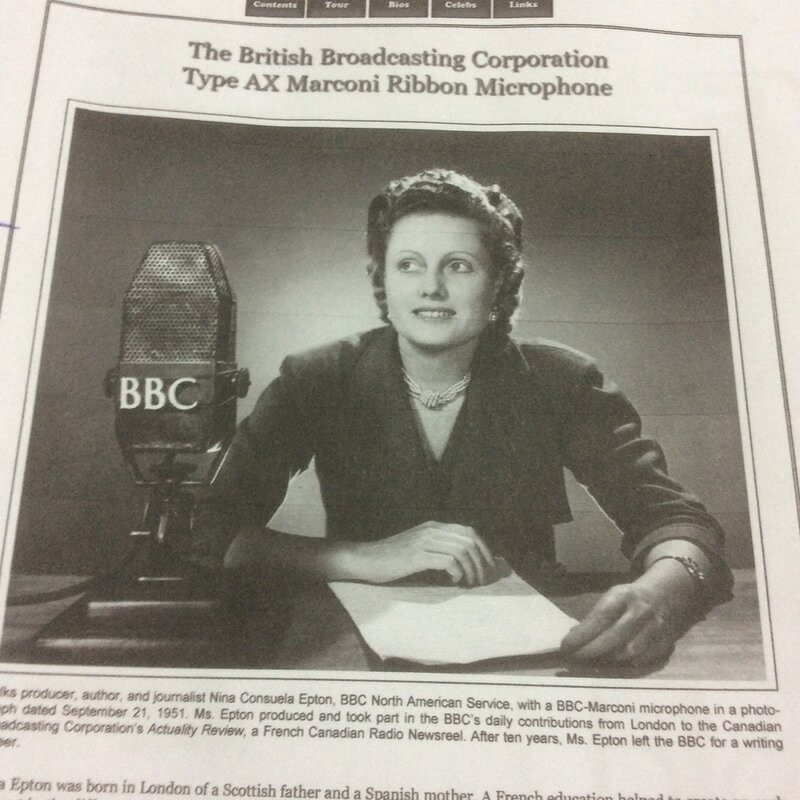 The BBC version was based on an RCA microphone used in Hollywood. In 1931 the American one cost £130 (about £5200 today).That was too expensive so BBC engineers set about designing their own. 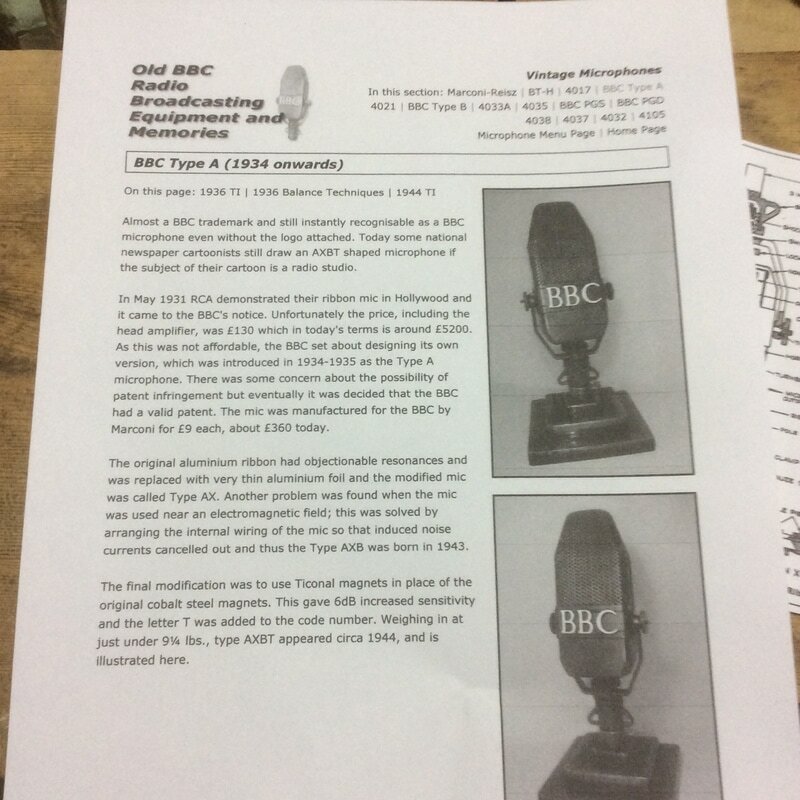 Manufactured for them by Marconi, the BBC version cost £9 each (£360 today). Brian said the most difficult part was finding how big the microphone was. Looking at photos of broadcasters holding one made them appear huge but there seems to be no measurements. 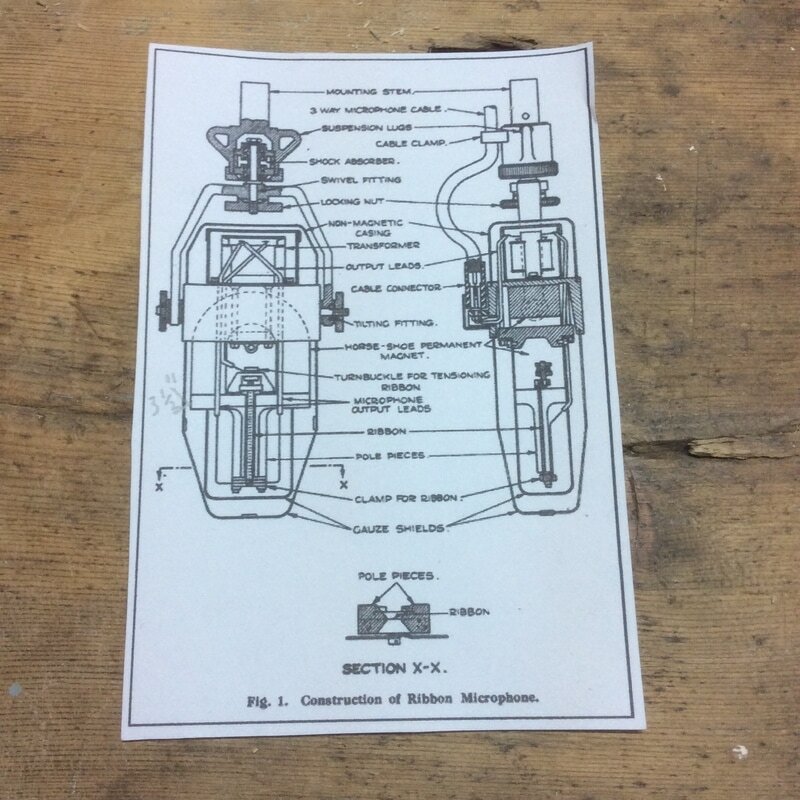 He tracked down an original technical drawing and the only part whose size was marked was the internal magnet at 3.5 inches. So he scaled up the drawing and found that the whole thing was over a foot long. I thought that he'd probably make it from bits and pieces in his workshop; and I was right plus he used other things such as bronze-coloured wire mesh and a number of plumbing pieces from Brico Depot. The results shown below are works of art ... and engineering! 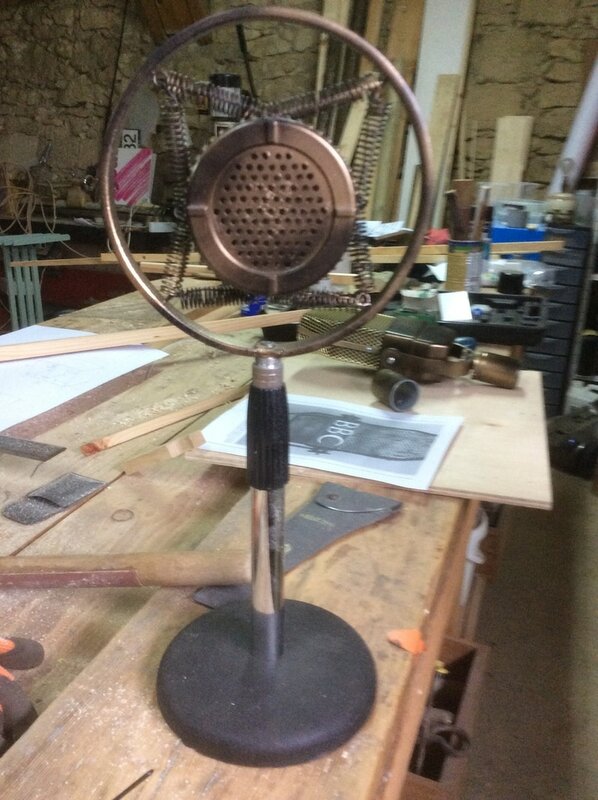 This beauty was made by Brian as a replica of the microphone used by George VI for his Coronation Day broadcast and will be used in A King's Speech.